When predictions tell Wendell Courtney he’s going to die, he turns to the one man he hopes can help. Jonathan Alvey’s no stranger to the strange. But, unlike the private investigator’s run-of-the-mill zombie cases, he can find no trace of magic around Wendell, and no hint of an adversary. Alvey certainly has magic and wits enough to solve the mystery, but is his offering to the insatiable dragon black sufficient? Or is Wendell truly destined to die? Magic with a hint of noir, that's my first impressions of R.M. Ridley's TOMORROW WENDELL. But of course I might be wrong. But one thing's for sure, every time there's a mystery involved, rest assure that it'll be one heck of a ride. Add some magic to it and I'm off to fantasy land. Want to know more? Check out this cool character chat with the man himself, Jonathan Alvey. A recorded interview with Private Investigator, Jonathan Alvey – interviewer’s name is not on record and will be listed simply as “I”. I: First off, I’d like to thank you, Mr. Alvey, for taking the time to do this interview. JONATHAN ALVEY: Wasn’t like you gave me much choice. I: I can be persistent when necessary, but I think you want to partake in this interview as much as I do. JONATHAN ALVEY:A: I’ll admit I’m intrigued by your level of competence. I: Let’s begin then, shall we? Alvey—it’s an odd name, does it have a meaning? JONATHAN ALVEY: Elf battle is the closest translation in modern English. I: A dramatic name for sure. It sounds like something out of a fantasy novel. As a child did you pretend that you actually battled elves? JONATHAN ALVEY: No, as a child I had no idea what my future would hold. I wonder if you recall what you wanted to be as a child? I: I’ve wanted to be a reporter as long as I can remember. JONATHAN ALVEY: Yes, I’m sure you have. I: When you were little, what did the other kids tease you about? JONATHAN ALVEY: They didn’t, when I was a young child I scared most other children. I: You were a bully? JONATHAN ALVEY: No—I scared them because I would talk to ghosts. I: You’re imaginary friends were ghosts? That’s a bit macabre for a child. What did you parents think of this? JONATHAN ALVEY: I never said they were imaginary, and as a minister, my father did his best to break me of the habit. I: Tell me more about your father? Did you have a good relationship? JONATHAN ALVEY: Your type doesn’t get to ask about my father. I: You don’t like reporters asking about your father? Is that because of the trial? JONATHAN ALVEY: You can leave now on of your own volition, or I can get up out of this chair. I: I apologize. Please, that was out of line. I’ll move on. Is being a private investigator dangerous work? JONATHAN ALVEY: I don’t know why I’m putting up with this. JONATHAN ALVEY: All right, fine. I’ve got a few scars, but too often its boring, repetitive work. Every now and then something interesting comes through my door, however. I guess today’s one of those days, which is why I’m allowing you to stay. I: That’s twice now you’ve implied I’m remarkable in some way, why is that? JONATHAN ALVEY: You’ll just have to take me at my word on that one—for now. I: You are a peculiar man, Mr. Alvey, but I’ll move on. How long have you been in the business? JONATHAN ALVEY: Almost two decades, in some form or another. I: That’s a long time; you must like what you do. JONATHAN ALVEY: It pays the bills. I: Surly there is more to it than that? JONATHAN ALVEY: There is more—it needs doing. I: Being a private investigator needs doing? How does spying on cheating spouses qualify as needing to be done? JONATHAN ALVEY: That part doesn’t, that part is what pays the bills. But the other cases, the other clients who need help and don’t have the skills to protect themselves—someone has to be there for them. I: And that someone is you? You make it sound like you are a hero more than an investigator. JONATHAN ALVEY: I’m no hero. I just can’t sit back and let the darkness swallow this hellhole of a city, one soul at a time. I: Sounds like your father had more influence on you than you let on. JONATHAN ALVEY: You have any other questions, because I’m just about done with you? JONATHAN ALVEY: Fine, but only so it gets you out of here faster. In my fridge there is a container of mustard, an apple my friend Ralph left for some reason . . . maybe to appease the harvest gods and—if I’m lucky—two beers. Any mores questions? JONATHAN ALVEY: One to wash away the after taste left in my mouth from answering these inane questions and one for my breakfast tomorrow. I: A beer for breakfast? You know with that statement, and the copious amounts of bourbon you’ve been consuming since this interview started, would it be a fair assessment to say you are an alcoholic, Mr. Alvey? And did the job drive you to it? JONATHAN ALVEY: Another stupid question. I: Why do you say that? JONATHAN ALVEY: Because if I were an alcoholic, I’d say I wasn’t. But no, I’m not an alcoholic. I’m an addict—I drink to self-medicate. I: So what are you addicted to then? JONATHAN ALVEY: The same thing as every other practitioner—the magic. I: Magic? You’re a magician as well as a private investigator? Do you do shows somewhere that I might be able to see? JONATHAN ALVEY: I’m no magician. I’m a practitioner. I manipulate the real world. I don’t do slight of hand. I: You’re trying to tell me magic is real? JONATHAN ALVEY: I can prove it to you—but I don’t think you’ll like it. I: Why won’t . . . I’ll take my chances, Mr. Alvey. Prove to me there is magic. JONATHAN ALVEY: All right. Put your fingers to your neck and tell me what you pulse rate is. I: I don’t . . .
JONATHAN ALVEY: Go on, check your pulse. I: I can’t seem to find it—odd. JONATHAN ALVEY: Now exhale onto this mirror. I: How does any of this prove magic is real? I: Fine, I’ll humor you, Mr. Alvey. R. M. Ridley lives with his wife on a small homestead in Canada, raising chickens and sheep. He has been writing stories, both long and short, for three decades, the themes of which range from the gruesome to the fantastical. 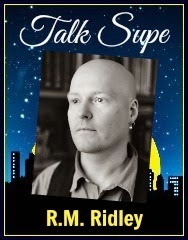 As an individual who suffers from severe Bi-polar disorder, R. M. Ridley is a strong believer in being open about mental health issues and uses his writing to escape, when his thoughts become too wild. 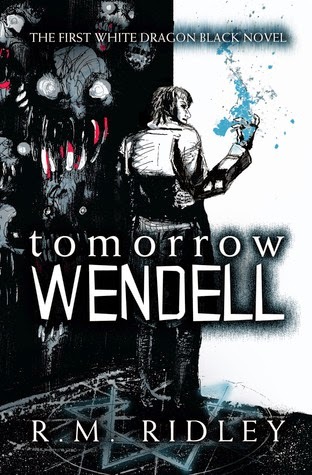 I've bundled TOMORROW WENDELL with another badass series, J.T. Geissinger's Night Prowler. These three combined I'm sure you'll enjoy your trip to fantasy land. Also don't forget to enter the print giveaway (US Only). Genre varies from contemporary, erotica to urban fantasy and paranormal romance. Good luck! LOL, loved the interview and that cover! It is crazy and slightly frightening. I love interviews like that, it's always fun! I didn't know this one but like Kindlemom says it, the cover makes me really curious too! thanks for sharing! I just love it when we make the authors talk to themselves. It's really fun enabling their madness! Love the sound of this one Braine! Gotta say that cover made me stop an look closely. Dude is standing in a star. Didn't expect that ending to the interview...LOL! Great posting! Yeah, I asked Mr. Ridley to interview his character so we can get a better sense of what the book is about.. Definitely wasn't expecting that one too. Doesn't it remind you of Black HIll Farm? Sounds like an interesting book lovely, thanks for sharing! Hahah that was super entertaining. Don't you love it when they talk to themselves? I gotta admit this isn't my usual fair, Braine. But after that interview, I'm very, very curious!